Our Popcorn is air popped making it a healthier alternative which is lower in fat and in calories. It also has a longer shelf-life. 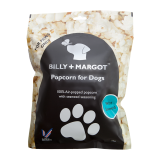 Categories: Billy & Margot, Dog, Manufacturers, Treats. 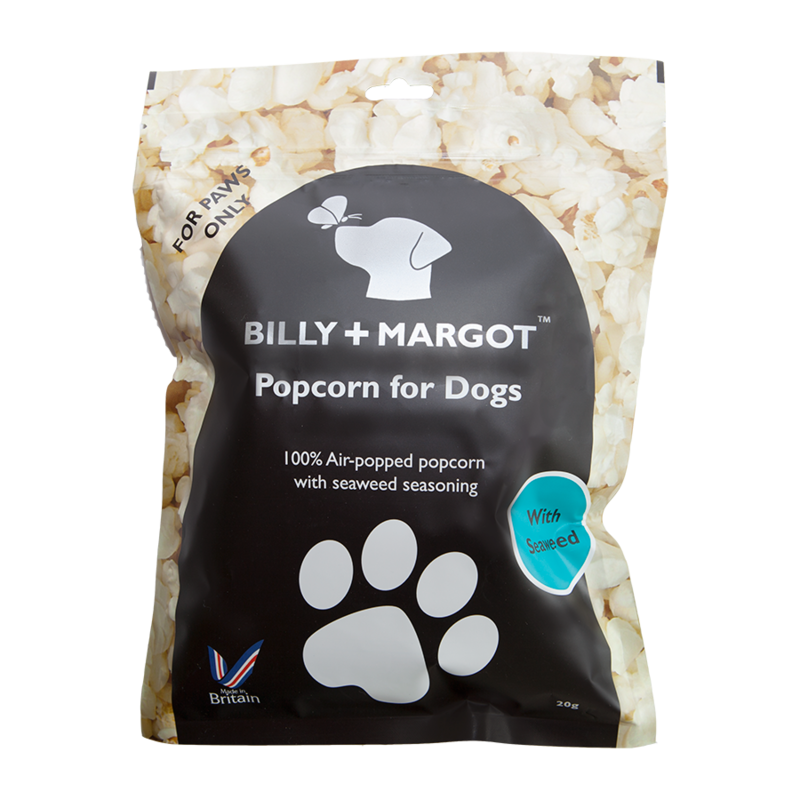 Tags: billy, billy & margot, dog popcorn, dog treat, margot, popcorn. Popcorn contains fiber and is 100% whole grain. It is also gluten free. Plain popped corn makes a healthy treat. As always we only wanted to use the best in our product so we opted for Uist Asco sustainably sourced Ascophyllum Nodosum seaweed to season our popcorn. It is seaweed off the northern Atlantic Ocean . 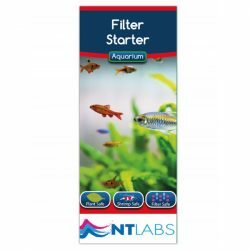 It is rich in a variety of minerals, vitamins and trace nutrients. Giving dogs grains is controversial. However, the problem with grain is not so much about feeding them to our dogs but more about how much they have. In recent years and because grains are cheaper than meat, pet food manufacturers have been bulking their feed with more and more grains. That’s really where the problem is. What we are trying to do at Billy + Margot is coming up with nutritious treats using good quality and whole ingredients. With air popped popcorn we feel we have not compromised on our values and it is a lot healthier in nature than most processed treats. It is difficult to make 100% grain free treats but corn along with oat and rice which are also gluten free are three of the best grains. But like all treats we give our dogs, they should be given in moderation and a bit of corn will not harm our dogs as long as their overall diet is balanced.